5 Minutes for Books runs a ton of reading challenges. 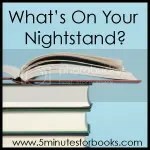 What’s On Your Nightstand is a monthly recap of what you are reading, have read and want to read in the next month. I’ve tried doing this before and always fall short of my goals because I get so sidetracked. Books that weren’t on my list at all end up being read while some on the list get pushed aside and so on. But…I’ll give it a whirl again because it is fun. Plus I like talking about books. The Devil Wears Prada. Lauren Weisberger. I listened to this. It was hilarious and just fun. I don’t know why I hadn’t read it earlier. Now I want to see the movie. The Art of Racing in the Rain. Garth Stein. This was a book club pick. I wasn’t thrilled with the choice at first. The idea of the book being narrated by a dog didn’t bother me, the car racing did. In the end I did enjoy it. The dog as a narrator allowed the reader to be witness to things they otherwise never would be. It was sad though. Sphinx’s Princess. Esther Friesner. A teen book about Nefertiti as a child and young adult before she was Queen. I’m about a third into it and am enjoying it. Having read Michele Moran’s books about Nefertiti and her family I am familiar with the gods/goddesses and many of the names so it isn’t nearly as confusing as the first book about Ancient Egypt that I read. I enjoy this time period but I also enjoy the fictionalized stories of these strong women characters that history only has footnotes for. The second one in the series, Sphinx’s Queen came out earlier this year so I am eager to finish this one up and get to the next. Sing Me Home. Jodi Picoult. Her latest. This one is about a married couple reeling from a stillbirth after many years of infertility. The loss is too great and they divorce. The woman falls into a relationship with another woman and wants to start a family with the frozen embryos remaining from her and her ex-husband’s attempts at IVF. A lawsuit ensues. I confess that I skipped to the very last page and read the ending but now being not quite halfway done I do want to finish it and find out how they got where they ended up. Bright young things. Anna Godbersen. It is set in NY during the end of the Roaring Twenties and the Jazz age. It is the coming of age story of three young women. It sounds like it should be a fun read. Surviving the angel of death : the story of a Mengele twin in Auschwitz. Eva Mozes Kor. This one is another teen book but this one is not going to be a fun read. I’ve always been slightly fascinated with twins though not in the way that Mengele was. I want to read this because it is told through the eyes of Eva as a child. She is still alive today and an incredible inspiration. Madame Tussaud: A Novel of the French Revolution. Michelle Moran. No real reason why I put this down except that something new and shiny came along. I do want to read this for the same reasons that I want to finish the Sphinx’s Princess. Madam Toussand was a fascinating person during a crazy time in history. What secrets did she see as she sculpted Marie Antoinette’s wax statues? I think that is about all for now. The I want to read pile is way too big to tackle. So, what’s on your nightstand?